How do I help a budgie with a clipped wing? 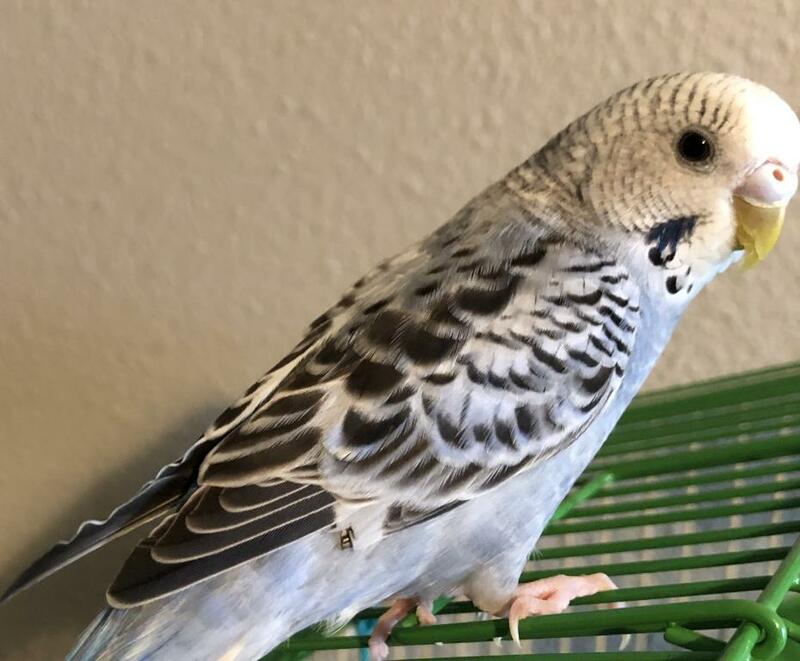 I got my budgies about 3 months ago. For the past month or so I've started letting them out of their cages to fly around and play and that's when I noticed one couldn't really fly and she'd frantically flap her wings then flop onto the floor. When I looked closer I noticed that one, just one, of her wings had been clipped. I've attached a picture but I can't seem to get a decent picture with the wing spread out, I don't even think whoever cut them cut the right feathers. I don't know if the pet store clipped them for whatever reason or someone got her then clipped one wing then returned her; either way, I had never wanted to clip my birds wings because I wanted them to be able to fly. Anyways she's been getting increasingly distressed by this as my other budgie likes to fly around the room and she tries to follow her but can't. It's really sad to watch her and it seems like sometimes she has these panic attacks or maybe it's just incredibly laboring for her because she'll try to fly for a few minutes and then flop onto the floor and is panting. Will they eventually grow back and Is there a way I can help her? She is a beautiful bird. I know how you feel, I got a couple of new birds last summer and the breeder had clipped them and I felt so sorry for them as they wanted so bad to fly around with the others. Unfortunately you just have to wait this one out.The clipped feathers will eventually molt out and be replaced with new ones and then she will be able to fly, but it will take a few months. Once just a few new feathers come in she will begin to be able to fly a little and at least prevent herself from dropping to the floor, she will be able to glide down.The panting you see is probably from her trying too hard to fly, sadly using all her strength only to fail because of the clipped wing. There are playgrounds you can buy that have ladders and swings on them that are meant for outside cage use, maybe if you had one of them it might interest both birds. I have a lot of rope perches and branches mounted to the outside of my cages so that birds can play on them when they are out as well as fly around. Is the clipped bird comfortable around you, maybe you could work on training her to step up while out of the cage to keep her busy. Since she cannot fly you need to supervise her when out, have a perch ready and when she does try and begins to fall offer her the perch so she has something to grab on to and does not end up on the floor. Firstly, a bird with just one wing clipped is usually quite unsafe, as they can get lift with the other wing and tend to crash sideways. Usually I would suggest clipping the other wing in a similar manner to keep the bird safe until its flights grow back in. Secondly, clipping the outer couple of flights is sometimes referred to as a safety clip, it is a genuine type of wing clip that is usually a good balance between saftey and being full flighted. Usually a bird with this clip (on both wings) can fly a short distance and maintain control of landing etc. It is probably the best of the options as the bird is still using its wings, building strength etc but can't fly away if it gets outside. The fact that your bird has this limited clip only on one wing and still can't fly may indicate other issues. It should be able to flutter a fair distance, but probably not in a straight line. It may be that it has crashed a few times and now doesn't want to actually take off, so is just flapping for exercise but not actually trying to take off. Hopefully it will moult out those clipped feathers soon and learn to fly properly. Thank you! I got a small playground a couple weeks ago, im thinking about building one, but i dont think she knows what to do with it yet, i stuck some millet at the top hoping theyll check it out eventually. I've been holding one of the wire things that were meant for the bottom of their cages under her so she can land on it, hadn't thought of trying to train her to step up while out of the cage though. Sadly I cant get ahold of her to do this so i will have to wait for her to moult. i did notice that she is spiraling a bit, she can fly out from her cage a few feet but I have to lift her back to it because she can only flutter a couple feet off the ground. With a "safety" clip a budgie is able to fly enough to escape if it gets away outdoors. Owners must always exercise proper caution in ensuring all doors and windows are securely shut and the budgie is confined in a bird-safe room fully supervised whenever it is allowed out of its cage.